《Teenagers should be allowed to choose their own clothes》PPT课件18 课本要点点拨 keep off 关闭; 阻挡 【语境领悟】 *Mobile phones should be kept off during the meeting. 在开会期间手机应该关闭。 *The old umbrell..
《Teenagers should be allowed to choose their own clothes》PPT课件15 Lead in Do you have any rules at home? Do you have any rules at school？ Do your parents allow you to do the following things? 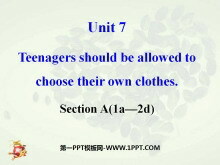 Obey the famil..
《Teenagers should be allowed to choose their own clothes》PPT课件12 Lead-in Discuss Do you have any rules at home? Do you have any rules at school ？ Do your parents allow you to do the following things? Fast-..
《Teenagers should be allowed to choose their own clothes》PPT课件9 Review Talk with your classmates about your school rules by using students are not allowed to. 一般现在时的被动语态 在英语中，动词有两种语态，..